Good news is that now we have a WhatsApp version for PCs running on Windows and using Google Chrome, Mozilla Firefox, or Opera web browser. You can install WhatsApp on your desktop or laptop computer with the all-new WhatsApp Web. You’ll be able to use WhatsApp right on your big computer screen. Last evening I was in an important conversation on WhatsApp but suddenly my mobile Internet connection broke down. Fortunately, at that time, I had an Internet connected laptop in front of me. So, I wondered, “is it possible to use WhatsApp on a desktop or laptop computer?”. I searched a bit on Internet and found that you can indeed use WhatsApp on your computer. WhatsApp Web was officially launched to help those users who are more comfortable on a computer rather than a mobile phone. Let’s see how you can install WhatsApp on your laptop or tablet or desktop. What is the problem in using WhatsApp on computer? First of all let’s understand why WhatsApp was not available for computers from the beginning. Well, the answer is really easy. WhatsApp was developed to be a mobile phone app. It was not intended to work as a messenger software installed on your computer (for example, Yahoo! Messenger). So, the developers of WhatsApp created various versions of WhatsApp for mobile platforms but not for computer platforms. You will find WhatsApp version for Android, iOS, Windows and BlackBerry etc. because they all are mobile operating systems. Computers, on the other hand, use operating systems like Windows 8, Linux etc. You can now use WhatsApp on you computer. Popularity of WhatsApp transcends the geographic and lingual barriers. People use WhatsApp in hundreds of languages (like in Hindi). So it was natural that lately the demand to have this app on computer grew tremendously. Soon, this app was being used on PCs through middleware Android Emulators like BlueStacks. As a result, eventually, the developers of WhatsApp have now officially offered us a method of interacting with mobile WhatsApp through your PC screen. Facebook, the social media giant who recently acquired WhatsApp, has brought in a much desired feature in the world’s most widely used mobile chat app. To install WhatsApp on your PC, please follow the steps given below. a) First of all, you must be a WhatsApp user on mobile phone (this feature is not yet available for iOS; which means you can not install WhatsApp for PC if you’re using WhatsApp on iPhone). Update: In August 2015, iOS version was also made available. Now iPhone users can also use WhatsApp for PC. b) You have to have Google Chrome, Mozilla Firefox, or Opera on your computer on which you want to install WhatsApp. Please note that this website works only in Google Chrome, Mozilla Firefox, or Opera. If you’ll use other web browsers like Internet Explorer, you’ll see and error. When you’ll go to the above mentioned website, you’ll see a QR Code, waiting to be scanned. WhatsApp Web QR Code in a Google Chrome browser. This code needs to be scanned for using WhatsApp on PC. 3) Now pick up your mobile phone and open WhatsApp. 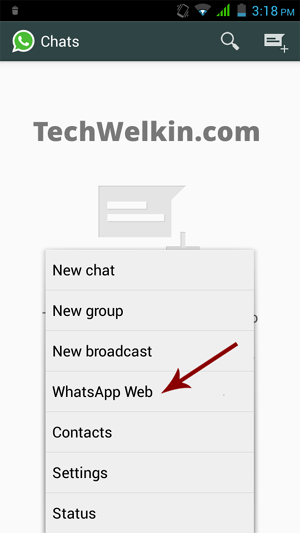 Open the main menu and select WhatsApp Web option. WhatsApp Web option in an Android based mobile phone. This option allows you to use WhatsApp on PC. An instruction will appear on your mobile, asking you to take your mobile camera near your computer screen and scan the QR Code. WhatsApp Web help screen. It prompts you to scan QR Code. Tap on “OK, GOT IT” to remove the instruction screen and let your mobile to scan the QR Code. 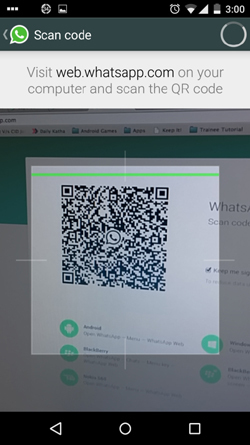 A mobile phone scanning the QR Code for WhatsApp Web. 4) That’s all !… As soon as the QR Code will be scanned, you will see that WhatsApp screen appears on your computer. 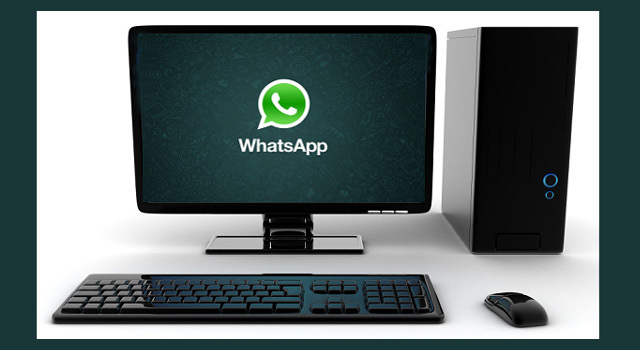 You can now send messages and do chat with your WhatsApp contacts right on your PC. Feeling happy?! I am sure you must be! WhatsApp on PC is especially useful for those who can not easily type on their mobile phones. On computer screen you see bigger font and it is much easier and faster to type using a computer keyboard. There are even more benefits. Let’s look at them. The first advantage is that using WhatsApp on PC will make your chatting experience much richer as you’ll be able to type messages much faster. You can easily send images and videos stored in your PC. You can download WhatsApp images and videos in your PC which will have much larger storage. Once the QR Code is scanned, you’ll remain logged in and would not need to login again and again. All rosy? Well, almost !… there are also a few drawbacks of using WhatsApp on PC. Let’s consider them too. What you see on you computer screen is merely a mirror image of your WhatsApp installation on mobile phone. This means that if you send a WhatsApp message from your PC, the same message will go from your mobile phone as well (but the receiver will get the message only once). Consequently, your Internet data usage will double up. Net connections of both your mobile phone as well as computer will be used. If you’re using WhatsApp on a computer that is used by others also, it could turn out to be a privacy problem. Any other person who is using you PC, will be able to see your WhatsApp message. He will also be able to chat with your contacts. I hope these instructions will help you in installing and using your favorite WhatsApp on your computer. Go ahead and use computer’s faster typing ability to send a flurry of nice status messages on WhatsApp. Should you have any questions in this regard, please feel free to comment and ask. I will try my best to assist you. Thank you for using TechWelkin! Can i use whatsapp with one phone number on two computers? Is it possible to use the front camera of my phone to scan the QR Code? My rear camera is kinda blurry. No, WhatsApp does not allow to use front camera for QR Code scanning. my phone got damaged few days back. Now i am using whatsapp from new mobile. I want my Whatsapp back up messages. How can i get it when already its synced with my gmail account. I need old messages. Hi, if I install and authenticate WhatsApp web on my PC and then switch accounts on my mobile, will the PC WhatsApp still work? The old WhatsApp account may work on PC. Once authenticated WhatsApp Web stays signed in unless you log it out (or until the login period expires). i was really facing big trouble to do it, your guide made it easy for me. I use Internet Explorer and installed WhatsApp on my Windows 10 laptop without a problem. No, you will have to scan that barcode in order to authenticate WhatsApp for PC. Dear, Team Lalit, thanks the entire operation of installing WhatsApp was explained in a simple manner and got installed easily. hi. can i login into multiple pc using 1 (one) account number at the same time? Hello & good afternoon. Hope you are doing fine. I’ve been using Whatsapp for quiet some years now. I do not know, whether there is a solution to my problem. One of my contacts has hidden his online/last seen status & simultaneously the “Read receipt” has been unchecked I’m afraid so that I cannot see whether my messages have been read or voice messages played. Is it possible for me to know some how that my messages have been read or the voice messages played? Would remain grateful to you if a solution could be found. Hi Lalit, how to install whatsAppweb on Opera. Its working fine on Google Chrome and Firefox but this page is not opening in Opera. Please help me out. To use WhatsApp, update Chrome or use Mozilla Firefox, Safari, or Opera. May be you need to update your Opera browser to latest version. Having an Internet connection and having a working Internet connection are two different things. Sometimes you may be connected to the Internet but the data transfer may not be taking place. This could be because of some temporary problem in your ISP network. Well, now that the desktop application is available, I can see WhatsApp Web fading out. The only ridiculous thing about this is that it is no different. One of the features I am hoping for in the future is for WhatsApp to finally stop relying on the phone for the PC app to work. What if I urgently need to send a message, but my phone is dead? I have contacts who only prefer being contacted via WhatsApp, so in the end, it inconveniences me. If only more people used Google Hangouts. Is there any way, I can install WhatsApp on PC without scanning the Code? My phone has broken down and repairing it could take upto a month. Can I switch off my phone while using my laptop to use wtsapp but by keeping the internet connection on?I mean will be able to send messages and get the messages back? Suppose i download a video or image on whatsapp on pc, whether the data will also used of mobile and also downloaded in mobile aslo? It’s possible. If you don’t log out, there’s no need to re-scan or log in again. It even works without my phone once I’ve log in. Hi Sir, please help, let me know how connect WhatsApp with PC without using phone data? It is not possible. WhatsApp for Web is just a mirror image of your mobile WhatsApp. So, bandwidth gets used both on PC as well as on mobile phone. Hi admin, I have a doubt. I m using WhatsApp Web in my PC since so many days and in my phone WhatsApp is asking update so if I update WhatsApp in phone will I logged out from pc or it will remain same in my PC? You should update WhatsApp in your phone. Even if you get logged out from your PC, you can always login again. I understood that thing what I m asking is if I update whatsapp in my phone then will I logged out from my computer or it will remain same? This can not be said for certain. It will depend on what update you’re installing. If there would be some something in the update that would require a logout, you will be logged out. 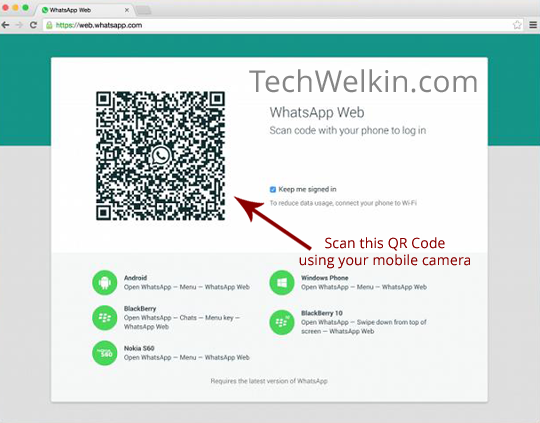 How can I use my laptop camera to scan the WhatsApp Web QR code? You can not use laptop camera for this purpose. The QR code has to be scanned with your camera phone. Hi, for some reason, my whatsapp doesn’t display the option for whatsapp web. I own and iPhone and have the 2.12.13 version. Can someone help me?? Sir, can WhatsApp web option gets hidden from mobile phone when we connect it to PC? I have a Samsung Galaxy S5 with whats app installed on it. Recently my phone broke and the display is gone. Is there a way to use WhatsApp for Web without scanning the QR code as I do have a alternative phone which does not support WhatsApp but my number active on it. I want WhatsApp on web as of now because I cannot get my screen fixed for couple of months and most of my business is on WhatsApp only. Please let me know if there is an alternative as i have been searching on web for almost a week now. Hi Kevin, there is no other way. 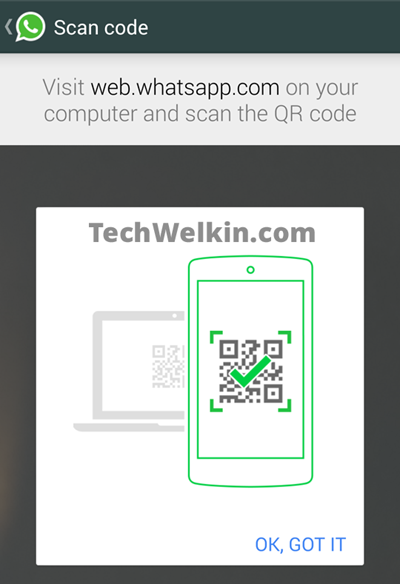 You will have to scan the QR code in order to authorize your computer to show your WhatsApp account. Is there any way to not show the information that I am logged on PC and to avoid showing location of that PC? Selecting this option will disable location sharing on WhatsApp. When I close the WhatsApp session and close the browser and want to use WhatsApp again the browser asks to scan the code again. Without installing WhatsApp application in system can we chat online like Facebook chats. No. If you want to use WhatsApp conversation on computer, you will have to install WhatsApp Web. Hi, I just came to know about the WhatsApp for Web. When I opened it on my phone I found that I was already logged in computer! I’ve logged out already. I have never used the WhatsApp for Web software. What are the chances that someone scanned my phone?! It appears that someone used your phone to authorize the computer to use your WhatsApp account. Please be careful about such things! can we use two whatsapp web for two andord phones on same laptop? I don’t think it would be possible in the same browser. But you can try using different browsers for two different numbers. Hi is there any way to do this without have a camera? Actually I have WhatsApp on BluStacks so there is no camera on BlueStacks. Do you have any idea how to do that? It is necessary for me that do it on BluStacks. Thanks in advance. You would need a camera phone to be able to use WhatsApp Web. Could you tell me where the images and videos received on whatsapp are stored on the pc? WhatsApp Web does not store images or videos on computer unless you download them. WhatsApp Web is merely a mirror view of your WhatsApp on mobile. if someone has done this for my WhatsApp, how can i deactivate the WhatsApp on their PC? how do i stop them from accessing my WhatsApp on their PC because it’s exhausting my data. does the whatsapp on their pc use my cell phone data? Yes, WhatsApp Web (also known as WhatsApp for PC) uses your cell phone data as well. So, if you use WhatsApp on PC, you will be using Internet connection of your computer as well as data connection on your mobile. Is it necessary to have active internet connection on phone also while using WhatsApp on PC? If there is no net connection on phone, will I be able to use WhatsApp on PC? Yes, Priya. you need to have internet connection on your mobile as well. Hi Vishu, as you have broadband Internet connection on your PC, you can make your PC a hotspot. That way you can use your broadband connection both on PC as well as on mobile phone. hey thanks! it’s amazing. Now I can use my WhatsApp in both PC and mobile! Hello sir, thanks for your help. You made my life easy, thanks a lot. While typing on PC in WhatsApp messages, I am unable to give paragraphs. I have to press space button multiple times, so that I can go to another paragraph. Is there any way to direct leaving a a paragraph? Please help me. You should check if your WhatsApp for PC is configured to send the message when you press the Enter button. If it is so, just disable this feature. Open WhatsApp. Go to Settings > Chat Settings. Uncheck the box in the “Enter is Send” section. We need to change it in mobilephone or pc? You need to check your settings in mobile phone. Someone has duplicated my WhatsApp account on his PC. How can I prevent him from reading my messages? I want to disable my WhatsApp access on his PC. Please help. I don’t have access to his PC. Sachin, WhatsApp account does not get duplicated on its own. As a security measure, there is a QR Code scan requirement. You must have authorized the said PC to use your WhatsApp account. You many try deleting your WhatsApp account from your mobile phone (WhatsApp Settings > Account > Delete My Account). It should disable access of your account on that PC. Later you can recreate a WhatsApp account. My suggestion would be that you buy a phone for yourself :-) because that is the proper way to do the things. I used to have whatsapp in my old phone but I couldn’t install it again in my new phone. it was working fine in my old phone yesterday, but now it shows that I need to install a new version which I couldn’t fined. please help. I alway use whatsapp as my primary chat app. Hi Lalitha, you should completely uninstall WhatsApp from your new phone and then install it fresh from Google Play Store. Older and out-dated versions of WhatsApp sometimes don’t work in new phones. That's exactly what has been explained in this article! I like the new web whatsapp but the only downside is that you cant use the web interface if you are not logged in on your phone. Which doesn’t really make any sense. Why would i need the web whatsapp if my phone is connected? Hi Larry, WhatsApp on PC is just a mirror image of WhatsApp on mobile. WhatsApp still is a mobile app. It is not a desktop based messenger software.